What's new in BayesiaLab 8? June 5, 2019: Washington, D.C. Built on the foundation of the Bayesian network formalism, BayesiaLab 8 is a powerful desktop application (Windows, macOS, Linux/Unix) with a highly sophisticated graphical user interface. It provides scientists a comprehensive “lab” environment for machine learning, knowledge modeling, diagnosis, analysis, simulation, and optimization. With BayesiaLab, it has become feasible for applied researchers in many fields, rather than just computer scientists, to take advantage of the Bayesian network formalism. 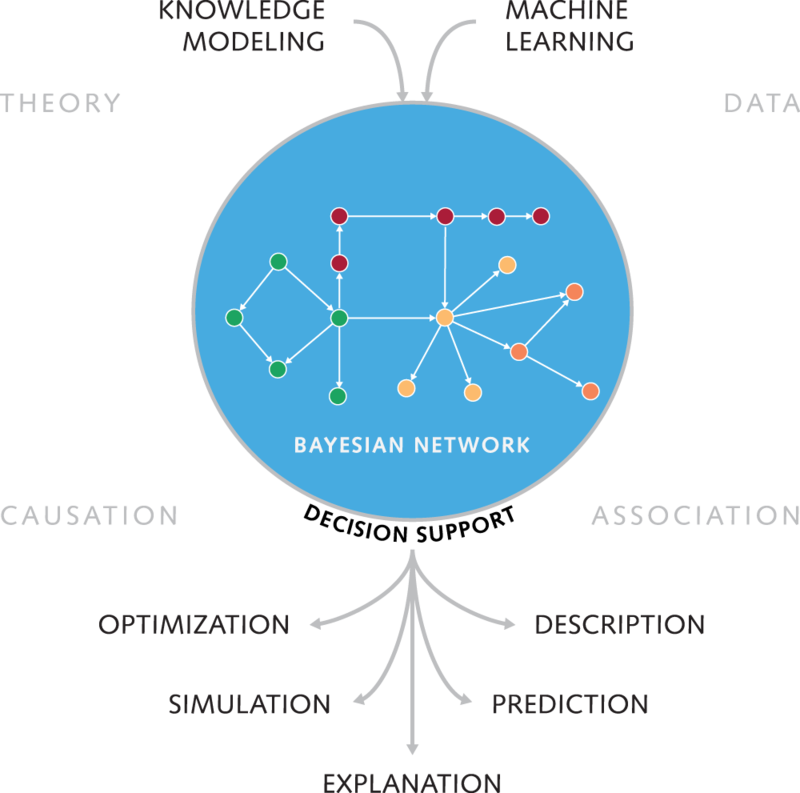 BayesiaLab builds upon the inherently graphical structure of Bayesian networks and provides highly advanced visualization techniques to explore and explain complex problems. As a result, a broad range of stakeholders, regardless of their quantitative skill, can engage with a Bayesian network model and contribute their expertise. What is a Bayesian Network? Invented by Judea Pearl in the 1980s at UCLA, Bayesian networks are a mathematical formalism that can simultaneously represent a multitude of probabilistic relationships between variables in a system. The graph of a Bayesian network contains nodes (representing variables) and directed arcs that link the nodes. The arcs represent the relationships of the nodes. Whereas traditional statistical models are of the form y=f(x), Bayesian networks do not have to distinguish between independent and dependent variables. Rather, a Bayesian network approximates the entire joint probability distribution of the system under study. Researchers can use BayesiaLab to encode their domain knowledge into a Bayesian network. Alternatively, BayesiaLab can machine-learn a network structure purely from data collected from the problem domain. Irrespective of the source, a Bayesian network becomes a representation of the underlying, often high-dimensional problem domain. The researcher can then use BayesiaLab to carry out “omni-directional inference,” i.e., reason from cause to effect (simulation), or from effect to cause (diagnosis), within the Bayesian network model. On this basis, BayesiaLab offers an extensive analytics, simulation and optimization toolset, providing comprehensive support for policy development and decision making. In this context, BayesiaLab is unique in its ability to distinguish between observational and causal inference. Thus, decision makers can correctly simulate the consequences of actions not yet taken.